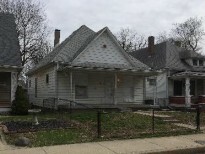 View - 1337 S Hiatt St.
Investors....Great income potential! Last tenant was paying $ 600/month. Needs cosmetic work on the interior. This home is on the bus line, close to Eli Lily and Downtown. With a little TLC you could generate guaranteed income through a Section 8 Program. Home is being sold "AS IS".